Scroll down to read further details on each project. Fryshuset, the world’s largest youth center, works closely with Sweden’s most pressing social issues, including social inclusion. Fryshuset teachers and youth leaders are in constant need of new and creative methods to address this issue. ​In partnership with Fryshuset, Stories for Society designed a training program for teachers and youth leaders entitled “Our Story.” Stories for Society created and implemented a four-day training program focusing on the topic of inclusion, with two days of theory and practice in the Island Method, and two days of drama exercises and transforming the story into theater. Stories for Society focused on providing teachers and youth leaders with inspiration and various tools that could easily be integrated into their teaching and daily activities. The project was sponsored by foundation Rights Now. ​Stories for Society was approached by Bosnian and UK-based non-profit Most Mira, Bridge of Peace to create a year-long program for their ongoing project, an annual theatre festival in socio-economically disadvantaged areas of Bosnia-Herzegovina where recovery from the war of the nineties has been slow. Ethnic differences and the conflict are difficult, sometimes impossible, topics to approach and new, engaging tools are needed among schools and youth centers. ​Our method was applied to train teachers and youth leaders from both sides of the ethnic divide in various towns, and support them in facilitating story-making with youth on topics addressing peace-building. In autumn 2014 Stories for Society experts undertook a week-long training, which included 3 days of training with teachers and two days of story-making with both teachers and students. The stories created were developed for the stage by a participative theater expert, who worked with teachers and students throughout the autumn to stage a final performance in their communities before the end of the year. The topic developed by the teachers was “connection,” meaning what connects us as people. In the spring of 2015 the week-long program was repeated in a youth center, and once again, the output developed to into a theatrical performance which was staged open-air in the middle of the town for the whole community to engage with. This time the theme developed by youth leaders was “Who is the Stranger?” This topic was identified as youth at the center had difficulty integrating newcomers. The project was sponsored by The Swedish Institute. Theme: Communication - How do we communicate relevance? An organization facilitating high school level educational exchanges founded in the immediate post-WWII period wanted to renew its message about relevance in a changing world and thereby improve its communication and competitiveness. ​Stories for Society arranged a compressed 4-hour story-making session in which staff and volunteers of the organization created a story about more effectively communicating their message of relevance in one of their markets, Sweden. The results were to be used as an input to ongoing strategy formulation. Theme: Collaboration - What's your corporate story? A public sector organization facilitating business exchanges between Scandinavia and countries in the developing world wanted to improve its collaboration with business in order to expand and raise the quality of the staff exchanges between companies. The exchanges were to lead both to the growth of businesses and to the overall objective of world peace through increased collaboration and exposure. Stories for Society arranged a compressed story-making process of three hours in which staff of the organization were tasked with creating a story of their organization for companies. The result was used as an input to the organization’s new strategy process. Teacher Training: Who are you? ​Provide a 1-day training to teachers from 20 schools in Sweden on using the Island Method in connection with The Order of the Teaspoon’s book, “Vem är du?” (Who are you?). 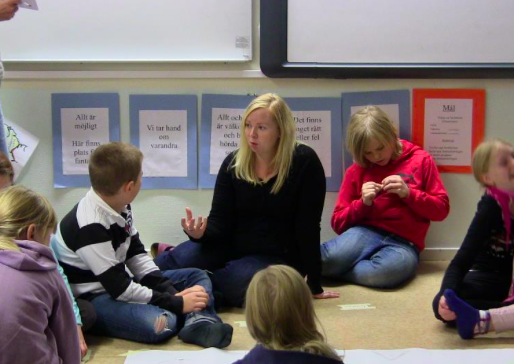 The book had been distributed throughout schools in Sweden in the Order of the Teaspoon’s efforts to promote tolerance and mutual respect, and the Order wanted a training program that could support teachers to use the book in the classroom. ​Stories for Society divided the training day between theory and practice, but focused mainly on giving the teachers practical experience of using the Island Method in connection with the topic “Vem är du?” (Who are you?). Teachers were provided with a detailed manual and with the opportunity to contact Stories experts for support as they applied the method in the classroom. ​Create a presentation by youth on the topics of peace and moderation for a commemorative ceremony honouring all victims of terrorist violence at the US Embassy in Stockholm on 9/11. ​Four stories were produced by children and youth in classes 6-9 during two 3-hour workshops, in which they worked in groups to express their stories of what happens when a visitor comes to their imaginary islands, where they wished for peace to exist. The participants were responsible for forming and expressing their stories themselves and the groups were facilitated by Stories for Society experts. Class 6 created their story in Swedish and the other classes created theirs in English. The workshops were presented at a ceremony held at the American Ambassador’s Residence on September 11th, 2011 commemorating all victims of terrorism and extremist violence. ​A primary and middle school in a suburb of Stockholm with students from many different cultural backgrounds urgently needed support in creating more cohesion in the classroom. A quick succession of teachers had tried to teach a 6th grade class, and overall there was a desire on the part of the school to create a healthier learning environment in that particular classroom. 5 of the 25 students had special learning needs. ​Stories for Society facilitated two story-making processes with students to address the subject of “Sammanhållning” (Cohesion), what it means and how it happens among a group of people. Students became very engaged with the story-making process and some were able to express their reasons for not being able to focus, which were personal and related to their own special circumstances. 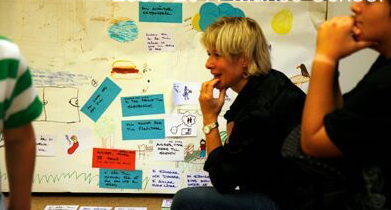 Stories for Society brought in one of its ‘play’ experts, who engaged and focused the students more. ​In 2011 Stories for Society’s collaboration with Munsö School was identified as one of Sweden’s most innovative school projects, and invited to exhibit and share our experiences with educators from other schools and non-profits at Scandinavia’s largest school expo. ​Train teachers working with different subject matter at Munsö school in our method so that they could integrate it into their curriculum. Simultaneously, provide a tool to all teachers that could help them to address bullying. ​Eight teachers, including the principal, participated in a two-day teacher training in the Island Method. During the following autumn term two teachers chose the topic, “Angår du mig?” (Do you concern me?) and a class of ca. 25 students in the fourth grade undertook two story-making processes, each facilitated by a teacher and supported by Stories for Society experts. The process of creating the stories together strengthened empathy and collaboration. Munsö School in Ekerö is a primary school located in the rural outskirts of Stockholm and teaches ca. 100 students up to the fifth grade. At a time of overall demographic change brought about by immigration into Sweden as well as the emergence of political forces that were a reaction to that change, the school was seeking a creative way to discuss how we should interact with the newcomers and the cultures they bring with them. The principal and teachers were concerned about maintaining an overall climate of civility and thoughtfulness in a school and community that had been culturally and demographically homogenous. The class of 20 students was split up into two story-making groups, each led by a Stories facilitator with the teacher moving between the two groups and providing support. Two separate stories were created focusing on the theme , “Alla är lika men olika” (All are the same but not the same). The theme was pre-agreed between the teacher and Stories facilitators. Students addressed challenging themes such as a lack of knowledge of different cultures and religions which is a source of apprehension, and what the symbols of the far right which had been sprayed as graffiti on the walls of their school and recently removed had stood for.